Of all the things that happened this summer, I think the most meaningful moment for me was teaching Charlie to ride his bicycle. Perhaps the experience was made all the more meaningful because, for all of Charlie’s gifts (and there are many) coordination just hasn’t been one of them. So, to get the boy atop two spinning wheels and having it become second nature was no small task. It’s amazing to think that just two weeks ago, Charlie could not ride his bike for more than ten feet before falling off. My eldest son can be quite the little chatterbox when he gets nervous and so the first thing I had to do was keep him quiet and focused on riding. We had the luxury of practicing on a long, quiet road at the Jersey Shore. Initially, I ran behind him, shouting orders at him like a drill sergeant. As I ran behind him, continuing the drill, all of the people we passed smiled and some even shouted words of encouragement. Seeing a kid struggling to learn to ride a bike brings out the best in people, I suppose, because the experience is so universal. 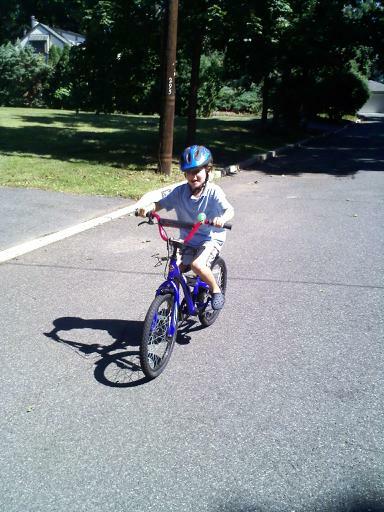 Soon, Charlie was steady enough on the bicycle that I could get on my own two wheels. He still couldn’t turn very well and needed a wide road to practice on, but he was going and going. This experience wasn’t without a number of scrapes and bruises, but much to my son’s credit, he kept getting back on his bicycle and soldiering on. “Look at me, dad! I made it to the end of the street!” Charlie yelled in triumph. This was not unjustified as the road was over a mile long. Soon, Charlie started learning to navigate turns, to angle onto the sidewalk and back onto the street. “Stay to the right!” I yelled as he occasionally swerved a little too far out into the middle of the road. So much of riding, of course, is about being aware of all the cars and trees and joggers around us. “Am I at second nature, yet?” Charlie asked. “Not yet, but you’re getting closer,” I said as I rode behind him. “You’ll know when it does,” I explained. Day in and day out we continued like this until, finally, I felt confident enough in Charlie’s riding abilities to venture to a playground a little further away. With his younger brother, Jamie, in the bike seat behind me, we pedaled to the playground. I had taken the boys to this particular playground many times before but never with Charlie on a bicycle. There was another six-year-old boy at the playground who was with his dad and his own bicycle. Within seconds, Charlie and this boy were off, riding around and around the perimeter of the playground. All I could do was watch as my son and this other boy rode along, laughing and riding effortlessly as if they were old cycling pros and old friends. Second nature had arrived for Charlie and I couldn’t have felt happier for him or more satisfied as a father.